It seems that the 3Doodler 3D printing pen is getting a new improved 2.0 version very soon, the project is already on Kickstarter and the goal of $30000 USD has been reached in less than an hour. The 3D printing pen that started this new segment will be slimmer, lighter, quieter and even easier to use according to the information and it should be available as early as February for the first 100 early bird backers at just $50 USD. The other backers should get their 3Doodler 2.0 3D printing pens in April/May time-frame and we suppose that about that time the product will be also available on the official website for sale. Currently checking the official website we can see that the older version of 3Doodler is out of stock, though you can still find the 3D printing pen being sold on various other websites. According to the official information it seems that the original 3Doodler has already sold over 130000 units, so you can really call the product a very successful one thanks to being very affordable when you compare the price to an affordable 3D printer. 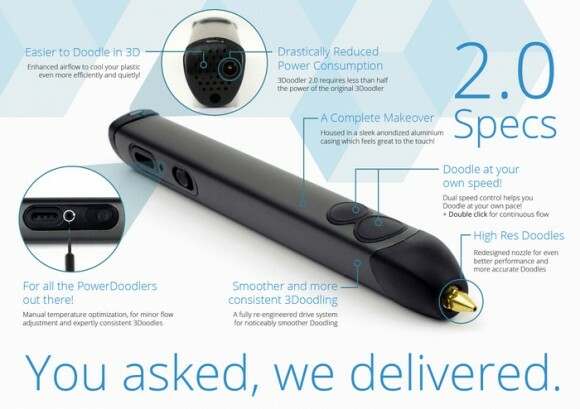 The standard price of the new 3Doodler 2.0 pen without additional accessories should be $99 USD, so it is getting better and still remains affordable. The new 3Doodler 2.0 is 75% smaller than the original, making it similar in size to a marker pen, it is also lighter at just 50 grams or half the weight of the original and should come with a stronger and better looking anodized aluminum case instead of the plastic one used by the original. These things should make the new 3Doodler 2.0 3D printing pen easier and more convenient to use as well as more attractive looking. But it is not just the look and feel that has been improved, the functionality also promises nice improvements such as lower power usage, optimized and quieter cooling, better speed and performance and more. We are already looking forward to seeing the final 3Doodler 2.0 and trying it out, even though we are not that big fans of 3D printing pens, the new version 2.0 does make us want to try one. If you are interested in the new 3Doodler 2.0 and you want to be able to get one earlier you might want to become a backer of the Kickstarter campaign, though we expect that very soon the official website will also start taking orders for the new version of the 3D printing pen.